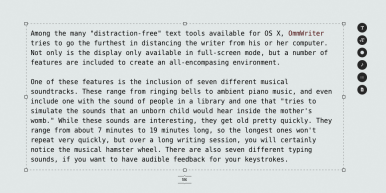 Among the many distraction-free writing apps available for OS X, OmmWriter Dana (Mac App Store link) tries to go the furthest in distancing the writer from his or her computer. Not only is full-screen mode the program’s only mode, but a number of the program’s features are specifically designed to create an all-encompasing environment. One of these features is a set of seven full-screen backdrops: all-white, a snowscape with leafless trees, a gray-linen background (that in my opinion doesn’t contrast enough with the program’s black fonts), and several colored-gradient backgrounds. There are no user-customizable options here—if you want your own colored background, you’ll need to look elsewhere. While these sounds are interesting, they can get old pretty quickly. They range in length from about 7 minutes to roughly 19 minutes, so the longest ones won’t repeat very quickly, but over long writing sessions, I certainly noticed the musical hamster wheel. There are also seven different typing sounds in case you want audible feedback of keystrokes. Unfortunately, you can’t change the volume for the music or typing sounds; they both play at set volumes, and some of the typing sounds are a bit loud. 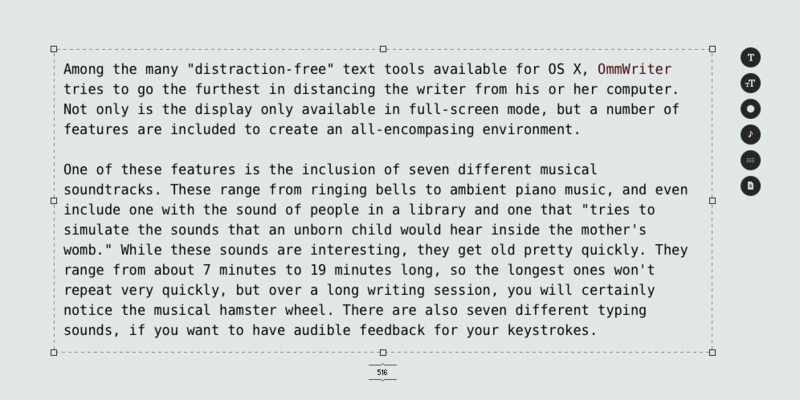 As with many writing apps of this type, OmmWriter is text-only. You can export to PDF or RTF, but you can’t apply WYSIWYG styles—just Markdown or HTML code for formatting. Unlike with some other programs, there’s no live preview of Markdown or HTML documents, and you can’t print from the program. If you want to print, you need to export to PDF or RTF, and then print from within another program. The program’s display options are limited to four sizes each of four different fonts: a proportional and non-proportional sans serif font, a serif font, and a cursive font. The fonts are solid, but with my aging eyes on a 27-inch Cinema Display, even at the largest size I wanted to be able to increase the font size a bit more than the program allows. OmmWriter Dana also uses a very small underscore cursor that can be difficult to spot when editing text and moving around in a document. A minimalist approach is used for accessing preferences, as well. When typing, you see only the text on the screen, but when you move the pointer, you see a group of circular icons to the right. Move the pointer over each of these icons to view its interface options. However, help tags aren’t displayed, so you need to try each button to see what it does. Despite my criticisms, OmmWriter’s goal is laudable: As the developer puts it, the program is a “humble attempt to recapture what technology has snatched away from us today: our capacity to concentrate.” Of course, it’s difficult for the developer of a minimalist writing app to peg exactly what a particular user will like and which features can be removed—for example, I’d appreciate being able to choose a different font, make the fonts a bit larger, and choose my own background image. But OmmWriter Dana is a solid writing tool, and if its interface decisions work for you, it accomplishes its goal.